Good morning, BLENDS. Are you wondering what a "blend" is? Beth, at Social Climbers, mentioned the term "blend", a blog friend. I love the terminology! Hope that everyone is enjoying the week. I've been busy here getting things ready for Christmas for my minnies and for family and friends. As most of you know by now, I LOVE all things crafty. Here are some of my latest creations. The Lilly Pulitzer paper products are absolutely amazing and the quality is top notch. The wrapping paper is a substantial weight and is concealing all of my non-Santa gifts this season. 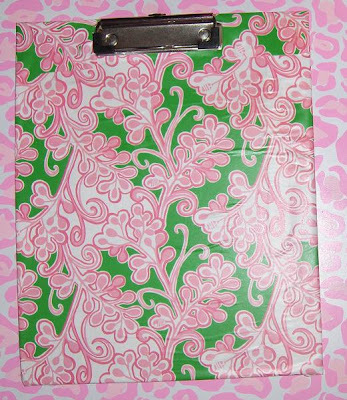 I used wrapping paper to create these adorable clipboards which were gifts for some very special Lilly loving ladies. 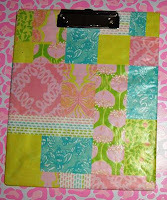 First, I used scrapbooking adhesive to put the wrapping paper on the clipboard. Then, using a brush, I covered the clipboard with a light coat of Mod Podge. You have to be careful to smooth the edges as you cover the board with the Mod Podge. The final step is to spray clear acrylic on the board to "fix" it. So easy and pretty! There's nothing I love more than getting a gift I can share with others. 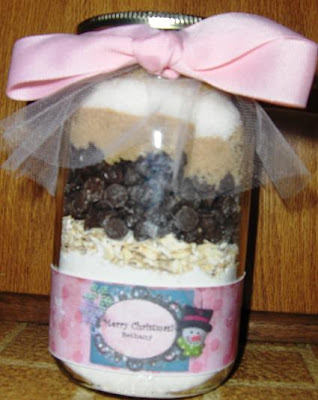 Mixes in a jar are a perfect gift for people who love to bake or cook. I've made soup mixes, hot cocoa mixes, and cookie mixes. This is a modified oatmeal chocolate chip Bakerella recipe. Rebecca was kind enough to make the labels for the jars. Of course, I had to bake a batch for myself, quality control, you know. They were DELISH! great idea with the clipboards! any preppy girl will love that!